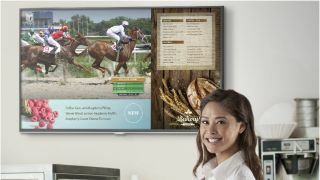 Samsung has unveiled a digital signage solution that offers split-screen television viewing and more than 200 content templates. Designed for micro businesses, Samsung's Smart Signage TV (SSTV) will be available this month in 40- and 48-inch models. The SSTV will enable business owners to display customized digital content - such as promotions, schedules, and available products - while simultaneously broadcasting live television. Users can connect to the SSTV via their laptop, tablet or mobile device to publish and update content. In order to install the content, users are required to connect to the SSTV via laptop or desktop. The SSTV features an LED-lit LCD display with a 1920X1080 resolution designed for 16 hours of daily usage. The TV, which features a 9mm bezel, comes with a wall-mount and stand. Users will be able to create content via a built-in content management system that contains more than 200 free templates that can be updated via mobile device. The SSTV comes with a commercial grade 3-year warranty, with dedicated service and support. Kevin Schroll, Senior Product Manager at Samsung, says the SSTV is ideal for businesses of fewer than five people because of its live television and content display capabilities. Unlike Samsung's Smart Signage Platforms, which are more suitable for larger organizations, Schroll says the SSTV is a "commercial-grade product for a retail setting designed for the small shop owner." "Enterprises require nationwide deployments that allow you to control content across different wi-fi networks," Schroll explains. "Most of the enterprise can centrally manage content across different networks. This isn't designed for that." Instead, the SSTV, is designed for a business owner that typically goes to retail stores to purchase standard TVs to meet their signage needs. The SSTV will be available for $749 (about £441, AU$798) for the 40-inch model and $999 (about £597, AU$1070) for the 48-inch model through major club and electronics retailers.